← Espressobaren Sorelle: what a difference a girl can make! A few weeks ago I mentioned my intentions to start running to – and back from – work every day and to buy more fair trade and/or organic food. I am pleased to report that I am not doing so bad on the first commitment. I have even started making detours to run a bit longer every day, with the result that I have done almost 40k this week. I even went out for a run early on this chilly but sunny Saturday morning. Unfortunately, I am not doing so well on the second commitment…. After a long week at work, I was tempted to stay in bed this morning. I had a nice dinner with friends last night, and although we were relatively reasonable (I was in bed by midnight), there was a fair amount of wine involved. So, just as I had convinced myself that I deserved to sleep in this morning, I got a text from a friend inviting me for brunch at 11 in Östermalm. That was all I needed to decide me to put my running shoes on and get out. The best decision I could make this morning. And the reward was excellent. By far the best breakfast I had in a very long time (and it was all homemade). On my way to the office after brunch, I remembered a nice café in the neighborhood that a colleague had recently brought to my attention. Even though I did not really need a coffee by that time, the weather was so nice out that I was in no rush to get to work. 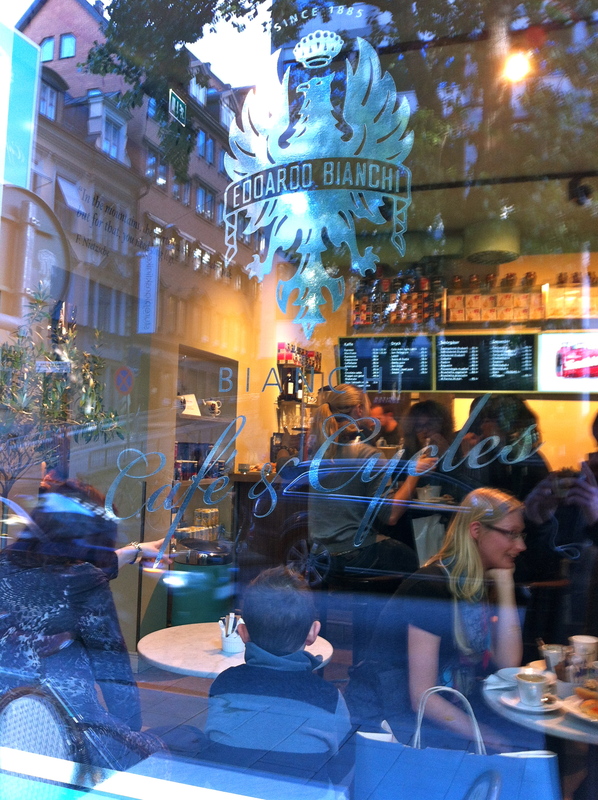 Obviously, I was not the only one who had decided to enjoy a nice coffee at Bianchi! Bianchi is much more than a café. It is an Italian cafetaria where customers can choose from Italian dishes à la carte or the antipasti buffet. There is also a typical Italian café right at the entrance of the store. One can also buy Italian food products such as pesto, tapenade, etc at the café. 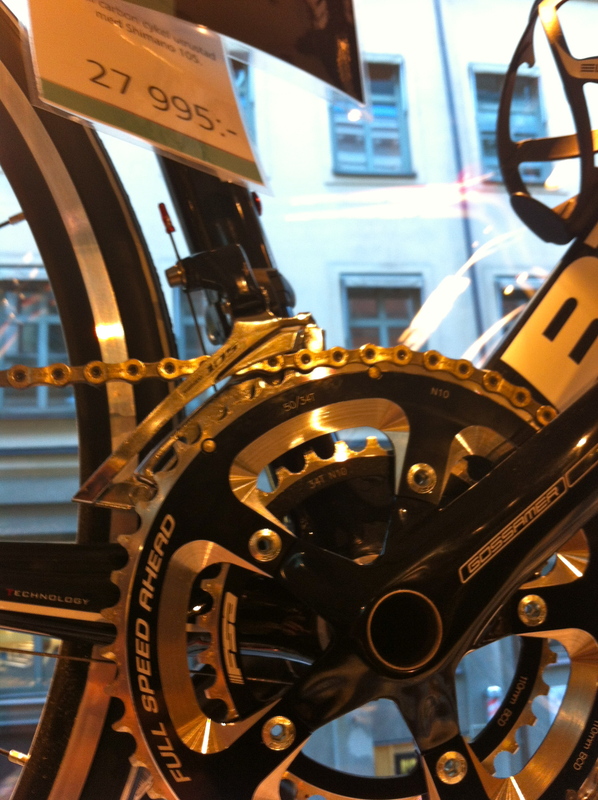 Finally, Bianchi is also a bicycle store! Bianchi attracts all kind of people: from the usual posh young Östermalm family with kids in a stroller, friends stoping by for a quick coffee, hungry tourists to bicycle enthusiasts. 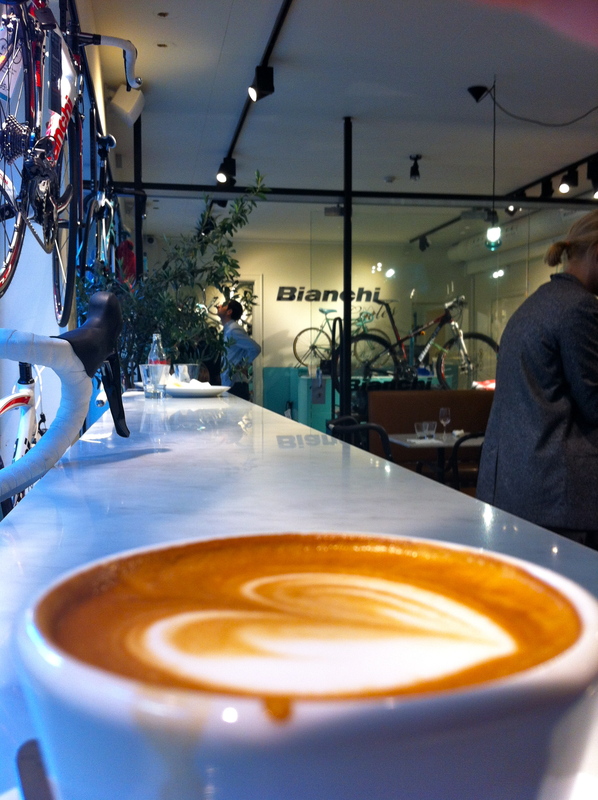 Overall, the place is quite large and Bianchi is not the type of café where you can quietly chat with the staff. 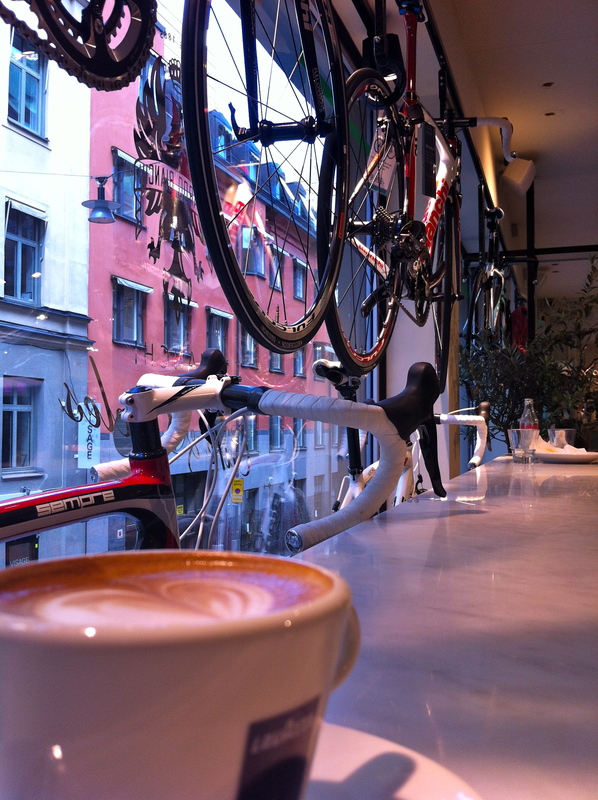 However, the place is lively, it is full of energy and it makes for a perfect stop in Östermalm. Last week, I went to Lidingö to support a few friends who were running the Lidingöloppet, a difficult 30k cross-country run in a very hilly part of the city. Lidingöloppet is part if the four Swedish classics, along with a crazy 300 km bicycle ride, a 60k (or 90k) cross-country skiing and 3k swimming race. To be a “real Swede”, one must complete the four events within 12 months. With the proper training I think I could do the Lidingöloppet. I have never done more than 15k in cross-country skiing but I can see myself completing this event (the 60k version!). Swimming for 3k would require a lot of training. I have never done any serious swimming and I understand from a friend who is now an Ironman that it can be quite scary when you have thousands of people swimming around you. Finally, the idea of being on bicycle for some 14 or 15 hours just seems crazy. 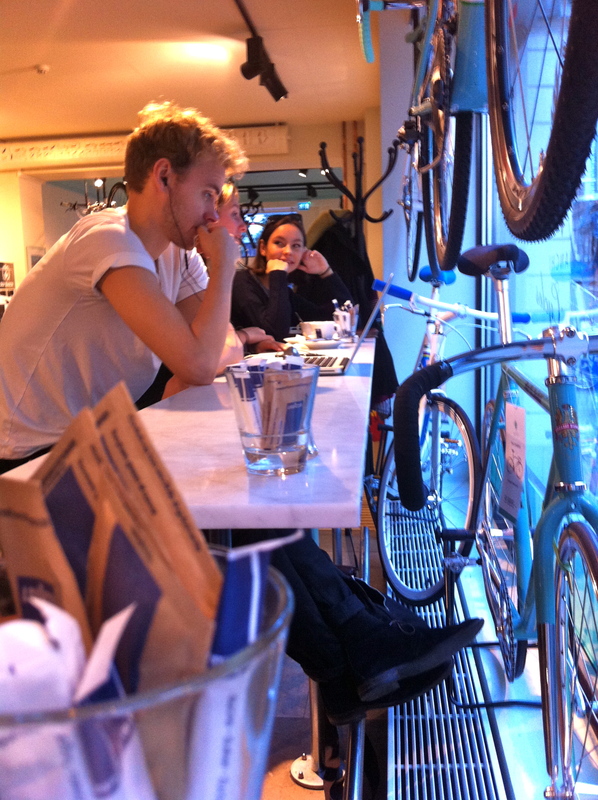 Besides, I would need a proper bicycle and as I was drinking my cappuccino at Bianchi I realized that I would probably have to sell my car to buy a bicycle. It was too nice today to spend too much time in the office. I will have to go back this weekend but that’s ok. I was able to enjoy a bit of sun and I have something to look for after the end of our big project: a long weekend in Paris! Of course, Paris is always beautiful. But more than anything, I look forward to seeing an old friend whom I have known for almost 15 years and who visited me more than 10 years ago when I was living in Paris. I also look forward to seeing the friend with whom I recently spend a weekend in Copenhagen… Yes, Paris will be great! Haha. Were the bikes that expensive? That’s an interesting concept for a restau – I really like the idea of a la carte Italian dishes! Omg how was Paris?! Envious of your proximity to all those travel opportunities! Oh this weekend! Well I’m glad I caught you before you left – now I can tell you to have a cafe pour moi! I’ve never been to Paris! !